BRISBANE, Australia, Nov. 15 (Yonhap) — South Korean midfielder Lee Chung-yong said Thursday that he is confident of playing a good game in his long-awaited national football team return. Lee is one of the 24 players in Brisbane, Australia, for South Korea’s two friendly matches this month. The Taeguk Warriors are scheduled to face Australia on Saturday and will take on Uzbekistan three days later. Lee is back on the national team for the first time since June. He failed to make the cut for South Korea’s final roster for the 2018 FIFA World Cup. Lee was becoming a forgotten man after the World Cup. Even after Paulo Bento took South Korea’s helm in August, his name was nowhere to be seen in the national team squad for September and October friendly matches. But Lee revived hopes of extending his national team career with impressive performances with his new club, VfL Bochum in the German Bundesliga 2. Lee, who moved from Crystal Palace to Bochum this summer, has so far bagged four assists in seven matches with Bochum. He assisted all of his team’s goals in Bochum’s 3-3 draw with Jahn Regensburg on Oct. 29 and also bagged a helper in the German club’s 2-2 draw with Greuther Furth on Nov. 2. Lee, who can play as a winger or a central attacking midfielder, will encounter fierce competition to earn a starting spot. 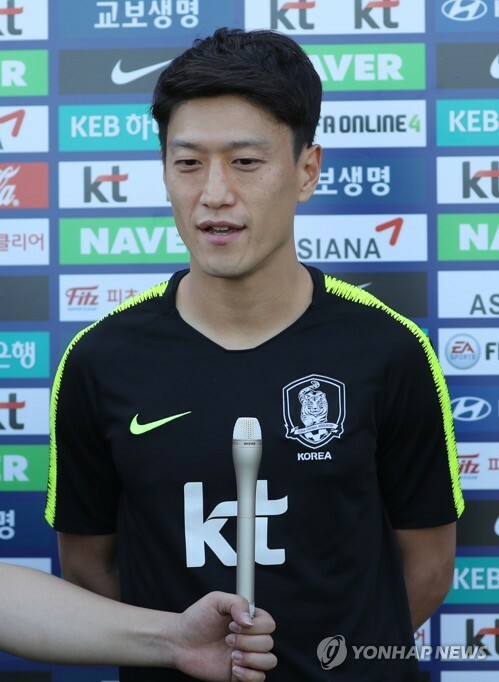 With Bento’s regular choices like Son Heung-min and Lee Jae-sung not selected for the November friendlies, the former Bolton Wanderers man will have to compete against players like Nam Tae-hee, Moon Seon-min and national team rookie Na Sang-ho. The two upcoming friendlies are tune-ups for the 2019 Asian Football Confederation (AFC) Asian Cup in the United Arab Emirates, which kicks off two months later. On Bento’s latest squad, Lee is the most experienced player. He has eight goals in 79 caps for South Korea. The 30-year-old said he doesn’t feel there are any difficulties playing with young and inexperienced players on the national team.